The Hasbro Pulse Instagram feed has posted another video from Steven Evans asking you, the collector, what questions you have regarding the line. Simply post your question on their video. Welcome back! 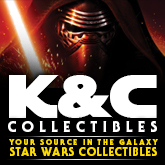 After a nice break and a Star Wars Celebration to cover, Jayson and Flyguy are back to break down the latest in collecting news. On this episode we discuss the big reveals from Celebration as well as new items hitting stores (and our wallets). All this and more on episode #110 of The Realm Recap! Click on through to check out the latest episode and feel free to subscribe to our channel.